DroneMapper recently acquired Trimble GPS RTK Base and Rover systems for ground survey to augment its aerial imagery collection operations. By combining ground truth, aerial targets and photogrammetric processing one may produce near survey grade digital elevation models (DEMs) and orthomosaics, precisely geo-referenced. Picture 1 illustrates the RTK setup. To get acquainted with the system operation we performed a number of surveys around the DroneMapper business property. 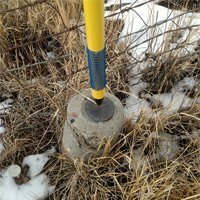 A search of the National Geodetic Survey (NGS) (https://www.ngs.noaa.gov/NGSDataExplorer/) identified three (3) high precision control points located at Blake Field airport, just north of Delta, Colorado. 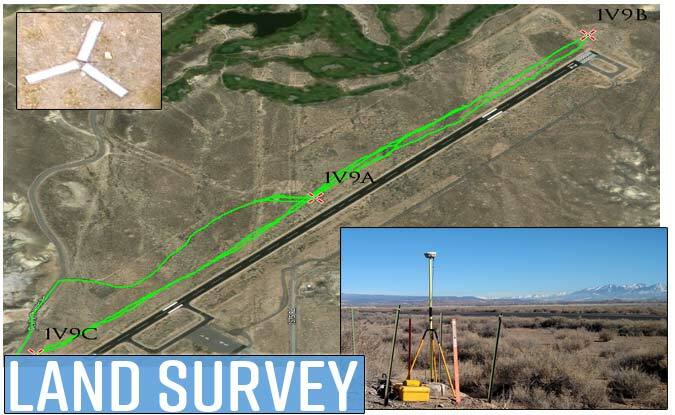 Picture 2 illustrates the control points on the NW side of the airport runway which is about 1 mile long. We utilized the base station to acquire Wide Area Augmentation System (WAAS) coordinates over the 1V9A monument and found the reported WAAS position was within 1 meter of the precise location in XYZ. We then keyed the precise position of the monument into the base station and used the rover to measure the other two monument positions. If your application requires high quality imagery collection combined with precise control for the highest geo-spatial accuracies please call the DroneMapper team. DroneMapper offers an affordable solution designed to enable continuous stockpile monitoring at any sized operation,Pierre Stoermer, CEO, said. The company’s main offering is photogrammetric software. “Either we process imagery for the client or the client licenses our Windows-based application(s) for their own use,” he said. “We also offer end-to-end training on drone and camera selection, use of aftermarket applications for autonomous, high-quality imagery collections, imagery processing and extraction of value-added info using GIS software.” Unlike many of its competitors, DroneMapper has already broken into the coal space. DroneMapper has been working with Arch Coal over the past 5 years in the development of an affordable work flow to accurately estimate coal stock pile volumetrics at the West Elk mine utilizing drone imagery collection, photogrammetric processing and GIS tools. The resulting work flow could lead to a significant cost saving by establishing accurate volumetrics with low latency compared with traditional manned aircraft operations. Further, more frequent drone acquired volume estimates can be used to check calibration of the real-time conveyor weight scale measurements to assure consistent calibration of mechanical systems. Arch Coal – is the second largest domestic producer of metallurgical and thermal coal, with 96 million tons of coal sold in 2016. Arch is a well-positioned American coal company with large, modern, low-cost mining complexes and high-quality reserves in strategic U.S. coal supply basins. In total, Arch represents over 13% of America’s coal supply from their complexes in Colorado, Illinois, Kentucky, West Virginia, Wyoming and Virginia. DroneMapper – provides photogrammetric cloud processing, desk-top software and GIS services for clients around the world. The team offers end-to-end drone operation services for imagery collections and processing as well as training. Typical products produced include high accuracy geo-referenced DEMs, DTMs, orthomosaics, point clouds, precision agricultural NDVIs, terrain contours and volumetric estimates, among others. Arch Coal is interested in accurately quantifying their coal stockpile inventory on a regular basis. One example of this is the West Elk mine in Somerset, Colorado. The facility is a long wall mine where the mined coal is conveyed out of the mountain and deposited on the terrain surface. Figure 1 illustrates one of the stockpiles with three coal stack tubes (central left of image) with conveyor system. 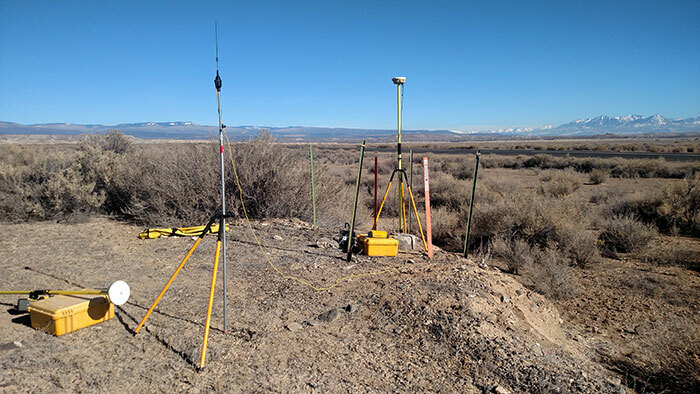 Ground control targets are used for every imagery collection to precisely align the imaged stockpile surface with the bare ground reference surface. Figure 2 shows the geo-referenced bare ground surface depicting zero volume or empty basin. This surface was precisely constructed using the control points that surround it. The colors represent the surface elevations with red the highest elevation and blue the lowest. Note the two ridges at the bottom of the surface illustration correspond to the ridge features seen in the stockpile image. Imagery was collected by Arch Coal using a DJI Phantom 3 Advanced quad copter flying at approximately 300-400 feet above the ground/stockpile surface. At this elevation, the Phantom 3 will produce approximately a 2-inch pixel on the ground. A traditional 80% overlap (forward and side) grid was used for nadir imagery collection. The nadir imagery was augmented with an orbital oblique imagery collection to obtain stockpile surface data obscured by the conveyor system above the piles. Figure 3 illustrates the camera pose during the collection for both the nadir and oblique shots. DroneMapper has shown that the use of nadir and obliques provide for a higher quality digital elevation model (DEM) with less noise and artifacts than nadir alone. Once collection was completed the images were sent to DroneMapper for control pre-processing, full photogrammetric processing to generate the DEM and GIS manipulation for volumetric estimation. DroneMapper utilizes its Windows based REMOTE EXPERT software for 2-D control file generation and photogrammetry. The 2-D control file is generated using a tool that selects the number of images at a certain radial distance from the control by comparing the image geo-tags with the GPS coordinates of the control points. In this manner, an operator does not have to review every image for every control point in the scene, saving time. Each image identified with a control point is then zoomed in to select the pixel that the center of the control target appears. Figure 4 shows typical aerial target control points, 3-leg targets, used in image processing. REMOTE EXPERT uses this 2-D file and a 3-D file (defining control X,Y,Z coordinates) along with the imagery for DEM processing. Figure 5 shows the resultant DEM. Quality verification is performed by comparing the control elevations with the elevations of those points on the DEM to establish the root mean square error (RMSE) for the control. The elevation RMSE is then used to estimate the elevation accuracy which directly contributes to volumetric estimate uncertainty. Typically, we see elevation errors of less than 1 pixel or < 2 inches for this case. DroneMapper employs Global Mapper, from Blue Marble Geographics, for all GIS processing. The two surfaces, DEM and bare ground are terrain combined or subtracted from each other to yield a volume model of the stockpile. The image looks identical to the DEM above, however the base of the model is at 0 meters elevation. Global Mapper then quickly computes the volume of the entire pile or sub-piles within the overall stockpile by digitizing the selected pile of interest for computation. Arch’s West Elk facility can now quickly and affordably utilize drone and imagery processing technologies to establish a comparative volumetric estimate at the times of their choice, weather permitting. This data may be used for calibrating or augmenting other weight or volume measurement equipment being used at the facility. The data also provides visibility on ground operations within the stockpile to assess inventories of coal in various processing stages for overall accurate inventory situational awareness. DroneMapper flew 4th Ave reservoir on November 14, 2017 using their Phantom 3 drone to collect imagery for precision digital elevation model (DEM) and orthomosaic generation of the site. Approximately 80 images were collected and processed via photogrammetry to yield the DEM and orthomosaic. Figure 1 illustrates the orthomosaic of 4th Ave reservoir, a few holding ponds and a small portion of Surface Creek to the northwest. Figure 2 illustrates the DEM (zoomed in) constructed for the reservoir. DroneMapper’s REMOTE EXPERT Windows application was used to generate the DEM and ortho from the image collection. Screenshots of the DEM and orthomosaic follow. REMOTE EXPERT generated the data products within one hour on our laptop, allowing processing in the field and mission verification prior to pack-up. The maximum capacity was calculated to be between 3 and 3.17 acre-feet. This is equivalent to approximately 1,000,000 gallons of water. Delta County, Colorado agriculture has the benefit of over 300 reservoirs on the Grand Mesa, many of which supply irrigation to the variety of crops grown. This time of year, the reservoirs are being drawn down providing an excellent opportunity to map and determine reservoir capacities. We had the opportunity to pack up our UTV with the DJI Phantom 3 advanced drone, gear, lunch and head on out to the Leroux Creek area of the Mesa. It is approximately 12 miles on Forest Service roads and 50” doubletrack to access the watershed from the Surface Creek trailhead (map shown below). Access to some of the remote lakes between 10,000 and 11,000 feet elevation can be difficult so our Wildcat is equipped with Stihl MS200T chainsaw, Pelican dust-proof drone case, extra fuel and Warn winch. The next few shots show the beautiful Mesa country on the way to Leroux. Half the fun is getting there! On this trip, we pre-planned and cached the missions for 3 reservoirs including Lucky Find reservoir which was drained to the deadpool. There is no cell or internet connectivity in the Mesa backcountry so we need to have a reliable remote location programming capability. We utilized MapPilot 1.5.0 for our mission planning and execution application. The screenshot illustrates the mission plan for Lucky Find utilizing 80% image overlaps flying at an elevation of 300’ above ground. Image collection for the lake area was estimated at 150 images requiring 11 minutes of flight time. The next picture is of Lucky Find drained down to the deadpool. Phantom 3 has been fully programmed and ready to launch for the mapping mission. Each contour is selected individually and a flat elevation surface created to compute the reservoir volume and surface area associated with the selected contour. This is repeated for the elevations of interest from the deadpool up to the elevation where dam spill occurs to determine reservoir maximum capacity. The blue dotted contour shows maximum capacity prior to drainage at the spillway on the southwest side of the reservoir. It is critical that the drone firmware and the mission application be thoroughly tested before departure to remote locations where no communications exist. If you need assistance for end-to-end mission planning and execution please do not hesitate to contact us.